Florida Leads the Nation in Manufacturing Day Activities for Third Year! For the third year in a row, Florida had more events to celebrate and promote Manufacturing Day (or Manufacturing Month as we like to call it!) than any state in the country! This is a testimony to how important manufacturing is to Florida's economy, workforce and educators. This year the MAf, MAF Center, FLATE and TRADE worked together to host 238 events including industry tours, open houses, job fairs, movie screenings and more. We are so proud of our partners and our members for really showcasing manufacturing in such a positive light. Students on industry tours doubled from 2013 to 2015, with 4,770 students participating this year! Tour hosts skyrocketed up from 72 in 2013 and 88 in 2014 to 636 in 2015!! Both educator and parent involvement more than doubled this year! In 2014, 39 counties across Florida participated; this year we had participation from 50 counties and a total of 54 proclamations! Student surveys showed an increase of 116% from girls participating on industry tours! Way to go girls!!! 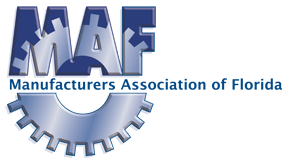 TALLAHASSEE, FL.— At the 12th Annual Manufacturers Summit and Marketplace on November 5 in West Palm Beach, FL the Manufacturers Association of Florida announced the winners of the 2015 Manufacturers and Distributors of the Year competition. Thirty-six judges narrowed the competition to twenty-one finalists in five categories. Each company was judged on leadership, strategic planning, customer and market focus, measurement, analysis and knowledge management, workforce focus, and process management. In addition to evaluation of the applications, the judges toured finalists’ facilities. Category 1 (1-40 Employees) – Endoscopy Replacement Parts, Inc. of Newberry. Category 2 (41-100 Employees) - NRI of West Palm Beach. Category 3 (101-250 Employees) – Fort Walton Machining of Fort Walton Beach. Category 4 (250+ Employees) – Sparton of DeLeon Springs. Distributor (Gold) – Aeroturbine of Miramar. Distributor (Silver) – ADI Metal of Fort Lauderdale. Other finalists included Amazon Hose & Rubber Company of Orlando, Miami and Tampa; Alumi-Guard of Brooksville; Conelec Electronic Manufacturing of DeLand; Dosatron International of Clearwater; Exactech of Gainesville; Hernon Manufacturing of Sanford; Kimball Electronics of Tampa; Knight’s Armament Company of Titusville; Kramski North America of Largo; Lockheed Martin Mission Systems and Training of Palm Beach; Mastercut Tool Corporation of Safety Harbor; Monin Gourmet Flavorings of Clearwater; Polygon Solutions of Fort Myers; Sancilio and Company of Riviera Beach; and The Smart Companies – Storm Smart Industries of Ft. Myers. The Manufacturing Sales Tax Exemption is set to expire in April 2017. The process for claiming the exemption will revert to a burdensome, complicated process that few small manufacturers will attempt. That is why THIS exemption is the best exemption – it is streamlined. Read Gov. Scott's statement on this important issue! The Manufacturing institute has published 5 career pathways under the Florida TRADE grant. The pathways include CADD, welding, industrial maintenance, machining and quality. The pathways are defined by both academic (credit based certificates) and workforce (occupational training) to fully capture both students and the current workforce. You can view each pathway report here. Enterprise Florida released the 2014 Florida International Business Highlights report, featuring growth trends, trade rankings by country, data on foreign investments and much more. You can learn more about Florida’s top 50 trading partners and many resourceful links to help walk you through doing business internationally here. Manufacturers in Florida are encouraged to register in the Florida Export Directory. Go to www.FloridaExportDirectory.com to register. TALLAHASSEE, FL, December 8, 2014: Manufacturing employs more than 328,000 people in Florida, with an average compensation of 69% more in earnings and benefits than Florida’s average. Yet manufacturers are reporting a shortage of workers with technical skills, including production, machining, welding, and quality assurance. Read more here. Today, the National Association of Manufacturers (NAM) is releasing a comprehensive report, available here, that reveals manufacturers’ competitiveness is at stake due to a lack of investment in our nation’s aging infrastructure. A targeted, long-term investment is needed from the public and private sectors to reverse these troubling trends. Doing so would increase jobs, grow GDP, provide a $3 return on investment for every $1 invested in infrastructure and provide Americans an increase in take-home pay after taxes. Click here to read more about the NAM's report in The Wall Street Journal (subscription required). This new report builds upon the frustration manufacturers expressed about the quality and condition of our nation’s infrastructure in an NAM-led survey last year. Infrastructure today is not positioned to meet future growth and demands. Ask your members to share this report with their employees and engage federal, state and local officials. The report provides the tools to think about this problem in a different context and begin to act on long-term solutions for our nation’s infrastructure. Together, we can make a difference with a unified voice. Please contact NAM Vice President of Infrastructure, Legal and Regulatory Policy Rosario Palmieri at [email protected] with questions or feedback on this new report.